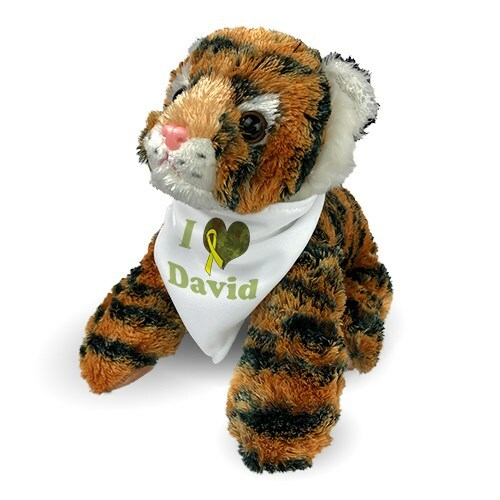 Personalized I Love You Military Tiger - 12"
Keep loved ones close to your heart with the one and only honorable Plush Bengal Tiger! This Special Tiger gets your heart purring with his silky plush fur, beady brown eyes and tiny pink nose! Make him yours truly when you add any one name! Measures about 12 inches and includes FREE Personalization! Free Gift Wrapping and a Free Gift Card is included to create a thoughtful presentation. Additional Details Shop Plush Zoo Animals with 800Bear.Com! Make Gift Giving fun with Customizable Plush Buddies or Shop By Occasion! 800Bear.Com is your Number One Destination for Adorable Custom-made Plush Bear Keepsakes!